It was a long trip (is it me, or are there too many planes with mechanical problems out there?! 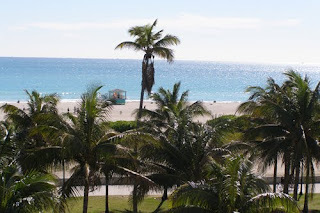 ), but I finally made it to my hotel in South Beach, Florida, in the wee hours of the morning. My last minute hotel seems to be a little hidden gem. The Cavalier is no thrills, but the room is cute, the location is perfect, the cost was reasonable and the Ocean is (literally) a stone's throw away. I'd be lying if I said I was fine with the three hours sleep I got before the morning activity began outside my room. I guess no one wants to sleep in South Beach. This is my first visit to what I've been told is one of the ultimate eating, drinking and just plain partying events. The South Beach Food and Wine Festival has been in existence for nine years and its popularity has been increasing with the celebrity status that the Food Network now brings to anything associated with it. This five day event is filled with parties, tastings and demonstrations for anyone who likes food and/or drink. In other words, it's for everyone. 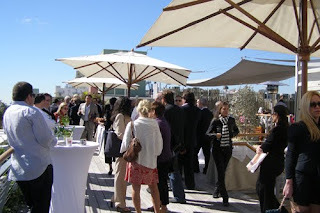 After a good dose of caffeine, the day started for me on the roof of The Betsy Hotel, where I mingled with sponsors, celebrity chefs, organizers and fellow members of the press. 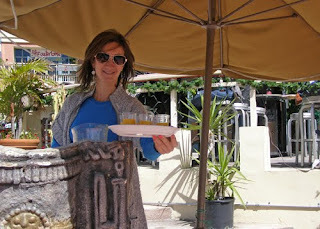 The mimosas were flowing along with the yogurt parfaits, fresh fruit and cheese, pastries and salmon & cream cheese sandwiches. While some thought it was a bit cool, I reveled in sunshine and temperatures above freezing for the first time in quite awhile. And the view from The Betsy rooftop (as you can see above) is memorable. Chef Daniel Boulud, an honoree at the festival was introduced as it was announced that this year's event outsold any before -- 52,000 tickets purchased, almost all events sold out. In the afternoon, I went to visit Maire Griffin, who happens to work for a "little" company called Diageo to check out their latest and greatest and I was not disappointed. There's nothing like a private tasting and it's even better when you get to pick. I checked out some wines, both new and old. The new was in the form of Jade Mountain Vineyard's White Wine Blend. This California vineyard blends Pinot Gris, Riesling, Sauvignon Blanc and Viognier and the oak barrel product is a genuine blend of dry and sweet, with just a hint of spice. I also enjoyed the Provenance (another Napa area vineyard) Sauvignon blanc, perfect on this mild day. Maire and I talked a bit about the great products from Rosenblum (an urban winery in the Bay area) and Sterling before I switched from wine to spirits. I was excited to learn that Captain Morgan is doing more than moving from Puerto Rico to St. Croix, they are creating an atmosphere to make their product with no waste going into the environment. I also got some news on Ciroc Vodka. The P'Diddy touted spirit is being released in Red Berry and Coconut, a flavor I have yet to taste in vodka. I didn't leave the Diageo suite without a sampling of my standard, but never dated, Tangueray No. 10 and tonic, but only one, because I have a party to go to tonight with a man named Emeril. I hear he knows his way around a kitchen.